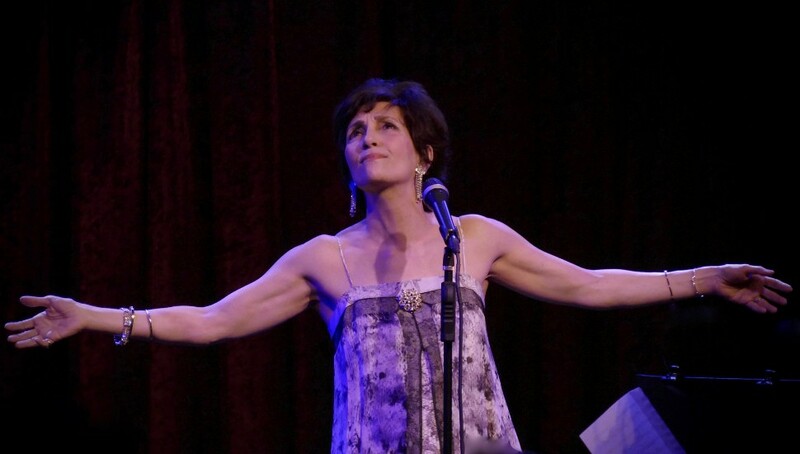 Barbara Fasano at Birdland Theater. Photo by JG. Picture yourself in a glamorous nightclub in the 1940s. Or imagine feeling free and easy during the swingin' '60s, ready to go downtown and have fun. "I Know A Place" brings those years right back. Maybe you remember the moments of meditation when you were yearning to know yourself. What felt most real? What reflected the real you? And what song brings it all back? Barbara Fasano, outgoing, effervescent and artistic, was brought up in a high-spirited New York Italian family and regular fans heard stories of her family's love for music. In this show, she remembers her grandfather's fondness for lyricist Harry Warren who joined Leo Robin to write the song, "I Wish I Knew," the title of Fasano's latest show at the Birdland Theater. It speaks for the singer and probably for most of us at one time or another. Barbara Fasano, with her exceptional pianist, Eric Comstock and talented Sean Smith on bass, presents a selection of expressive stories and literate songs, examining life's perplexities and fascination with intelligence, maturity and life's earthy experiences. She opens the show with a Harold Arlen and Ira Gershwin's dreamy-eyed "Here's What I'm Here For" from A Star is Born (the 1954 version with Judy Garland and James Mason). As the song says, "You'll find is what I'm here for/to share a journey" and she then breezes into a breezy finger-snapping "S'Posin'," with Smith's bass backup. The trio, all there doing what they do best, brings to mind a movie photo of Bogie and Baby, with sideman Hoagy Carmichael ready to add his indispensable complement. Fasano goes back to those years of slow dancing the night away to romantic ballads like "Where or When" and the jazzy sophistication of "As Long As I Live" and "How Little We Know." She reveals palpable yearning with "I Wish It So," from the musical, Juno, and adds a look back at childhood and its freedom to try and express anything, in "I Used to Like to Draw," by Renee Rosnes and David Hajdu. Thoughtful days are reflected by Fasano with "Cactus Tree," Joni Mitchell's musing about the tapestry of her life, remembering lovers of her youth in the years when she was busy being free. It is a melancholy musical drama that Fasano does so well. She brings a similar contemplative feeling to "Thunder Road" by Bruce Springsteen and includes Jimmy Webb's evocative "Time Flies." She is a captivating performer, delivering songs with an actor's depth and emotion and well-trained vocal strength, throaty when she conveys down-to-earth sexiness like the sly temptation of "Hurry On Down." Even as she sings the line, "I'm as blue as I can be," Fasano has fun teasing and tempting with this 1947 Nellie Lutcher song. In "A Kiss to Build a Dream On," the rendition lightens for a springy delicacy. She brings out the tenderness in "Sweet Baby James," what James Taylor calls a "cowboy-song lullaby" written as he was driving from Boston to North Carolina to meet his newborn nephew. On the mark was the finale, "It's a Pity to Say Goodnight," to this witty and passionate show exploring memories and life with one artist who understands what the songs are saying, how they should be sung and has fun sharing it all with us.